IFIC Bank New Job Circular published on 08 December 2016. IFIC Bank will recruit various posts for the year 2016. 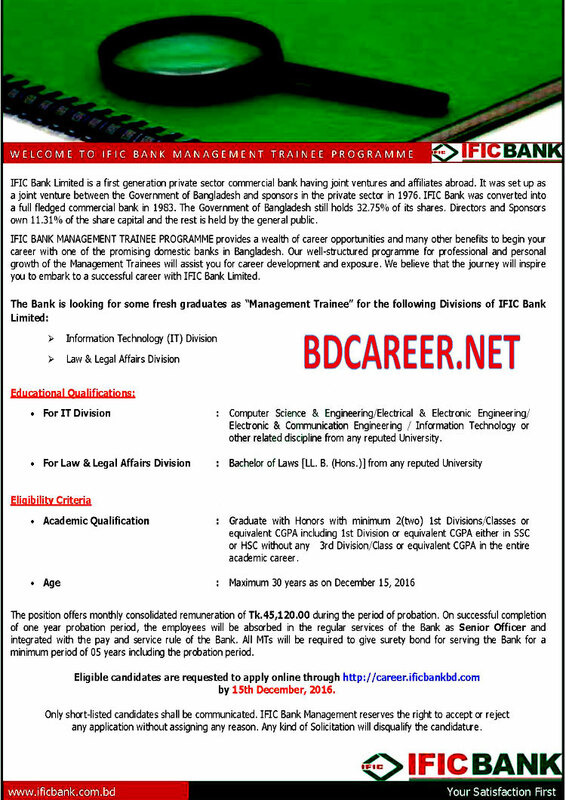 IFIC Bank New Job circular 2016 for the Various Post published on 08 December 2016. Interested and suitable eligible candidates are requested to apply online for the vacant positions. IFIC Bank latest Job Online Application Deadline is 15 December 2016. IFIC Bank reserves the right to accept or reject any application or appointment of the candidates without assigning any reason whatsoever. Application Instructions: Interest and eligible candidates are requested to apply by online through only IFIC Bank Website i.e. http://career.ificbankbd.com. Candidates need scanned passport size photograph and signature for online application.